Your Career. Your Life. Your Future. Are YOU in the driver's seat? Our next public program is a retreat at the fabulous Perricoota Vines Retreat in picturesque Echuca-Moama on November 24th & 25th 2015. We're also running a program in the Melbourne CBD on 7th & 8th December 2015 so you can set yourself up to hit the ground running in 2016! Taking registrations now for our Echuca retreat on 24th & 25th November 2015 and our Melbourne program on 7th & 8th of December 2015. Early Bird - (GST incl.) Available until 20th November for Echuca Retreat and 21st November for Melb CBD workshop. PLEASE NOTE: THE PRICES ABOVE ARE FOR THE TWO-DAY WORKSHOP SESSION ONLY PLUS MORNING TEA, LUNCH & AFTERNOON TEA AND PARTICIPANT MATERIALS. 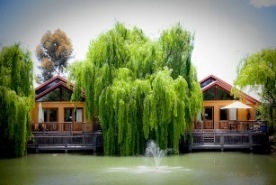 FOR THE ECHUCA RETREAT, ACCOMMODATION IS OPTIONAL AND EVENING MEALS ARE NOT INCLUDED. 1-BR LAKESIDE SPA VILLAS ARE AVAILABLE AT $130 PER NIGHT at PERRICOOTA VINES RETREAT. PLEASE CONTACT BELINDA AT THE VENUE TO BOOK ON 03 5482 6655. See www.perricootavines.com for more information about the venue. You registration, less a 20% handling charge, will be reimbursed if you are unable to attend the workshop - advise us by COB 10 days before the workshop. We are unable to accept cancellations after this date, however, you are welcome to send a person in your place. We would love you to join us if you want to get serious about making some changes to be your best self at work and in life!